An old-fashioned porch swing adds charm to the decor of a front porch. Before you purchase a porch swing, locate the roof joists on the porch ceiling with a stud finder. The roof joists are horizontal beams that support the roof. If you hang a porch swing from the ceiling without anchoring it to a joist, it won't support enough weight to use. 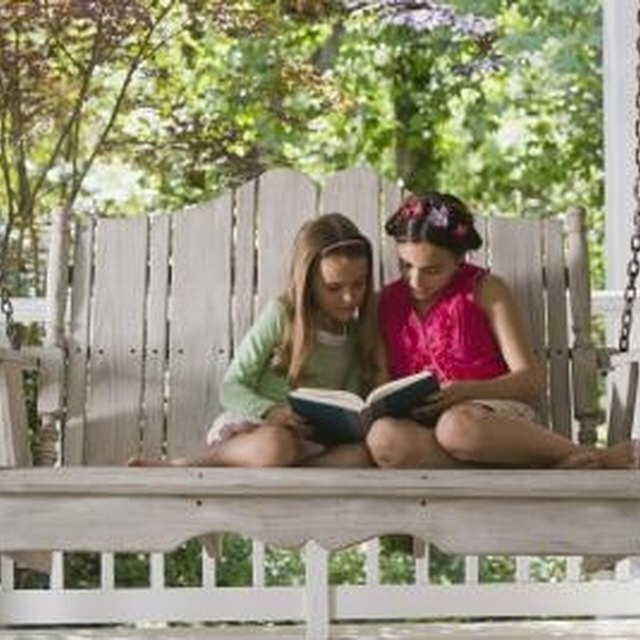 Hanging a porch swing will require two to three people. Install a swing on your front porch. Measure the width of the porch swing. Use this measurement to mark the ceiling where the screw hooks will be installed into the roof joist, using a stud finder to confirm the location of the joists, if necessary. Drill holes that are a bit smaller than the screw hooks that are provided with your porch swing. Manually screw the shafts of the hooks into the drill holes. Use pliers to give them a final, secure turn. Measure the height of the porch to determine the length of the chain. Porch swings normally hang about 18 inches off the ground. The length of chain you'll need will be the height of the porch minus 12 inches. Cut the chain with a hacksaw, if necessary. If you know the chain length you need when you buy the chain, you can get it cut at your home and garden center or hardware store. Attach the bottom of the chains with chain connectors to the eyelets in the arms or seat, depending on the design. The connectors open and close to loop over the end of the chain and the eyelet. Repeat on the other side. Lift the swing about two feet above the ground and have another person attach the chains to the screw hooks in the ceiling using chain connectors. Connectors are not needed if you'll be hanging the porch swing from "S" hooks. Depending on your porch swing's design, you'll need one or two chains per side. Lower the swing and push it gently to test it. Your porch swing should be ready for use. If you can't locate the roof joists, use a porch swing frame instead. Use galvanized or stainless steel chain and hardware to prevent rust. Don't make the holes in the ceiling joist too large, or the screw hooks may become loose of fall out from the weight of the swing. Don't attempt to hang the swing without help. Wear safety goggles when drilling wood and cutting metal.